Many residents attending the city of Sun Valley’s public forum Monday, Aug. 18, were buoyed by a proposed amended Comprehensive Plan that would reduce the parcels of land slated for future development and designate the west side of the Sun Valley Gateway as recreational space. On the agenda was the 2014 Comprehensive Plan Update, changes to a 2005 guiding document that outlines development and growth in Sun Valley. Mayor Dewayne Briscoe had appointed 20-plus Sun Valley residents to a Comprehensive Plan Steering Committee in January 2013, and they met for 13 months to amend the existing plan. They turned over their recommendations to the Sun Valley Planning and Zoning Commission, which finished preparing the new document in late July. Following public comment Monday, the plan was turned over to the City Council, which will begin reviewing the document in September. Items of interest were the Land Use Planning Areas (LUPAs) that cover land owned by Sun Valley Resort. The newest draft reduced six existing parcels for future development to three. The LUPAs represent a long-range vision of community development and city representatives were quick to say that mapping them is simply a general planning tool. “The Comprehensive Plan is a 50,000-foot guide, but zoning ordinances are actual law,” said City Attorney Adam King. The three remaining LUPAs presented at Monday’s meeting concerned the Sun Valley Commercial Core, Dollar Mountain/Prospector Hill and the Sun Valley Gateway areas. Previously on the table were LUPAs for the Gun Club/White Clouds area, Community School/Horseman’s Center and River Run. Regarding the commercial core, the maps designate the unofficial parking lot located across Dollar Road from the Sun Valley Pavilion for residential multi-family development. The 2014 update recommends the land-use designation change to Resort Commercial zoning. Community Development Director Mark Hofman said the boundary and zoning designations have carried over from 2005 planning, and it’s up to the City Council to change density and text if they so choose. For the Dollar Mountain/Prospector Hill LUPA, there are large swaths of land, particularly on the west side of Elkhorn and Fairway roads, designated as medium density, or up to 14 residential units per acre. The plan envisions roughly 40 units in the area east of Carol’s Dollar Mountain Lodge. “It’s a slightly larger area but same density,” Hofman said. The area known as the Sun Valley Gateway—along Sun Valley Road—has historically been the most important parcel to be left open in most Sun Valley residents’ minds. The pastures between Ketchum and Sun Valley could house residential areas behind the tree line on the west side of the meadow and just north of the Bitterroot subdivision on the east side, according to the 2005 update. The 2014 plan does away with both these proposals, suggesting Open Space designations on the west side of Sun Valley Road and Open Recreation on the two lower parcels on the east side. Open Recreation means that the green space could be used for festivals, horse corrals and the like. A small parcel on the east side, fronting Bitterroot Road and adjacent to the iconic red barn, would be designated medium density. Hofman said the idea is to keep developments close to either the Ketchum or Sun Valley commercial core, preserving the open space in the middle. Increased density in certain areas owned by Sun Valley Co. would be a compromise with an Open Space rezone for the gateway, resort representative Wally Huffman said. “We’re in a better place than five years ago,” Huffman said, citing Sun Valley as the only government in Idaho with LUPAs. 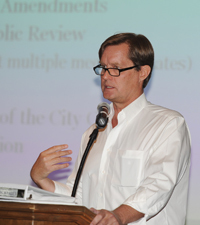 In the open forum, many citizens praised the city and the resort for keeping the gateway largely unobstructed, but some Bitterroot Road residents were concerned about the possibility of medium-density occupancy in front of their subdivision. The large electrical grid south of the proposed parcel might make the area less than desirable for prospective dwellings, one commentator said, and Bitterroot Road homeowners could suffer from decreased property values and more traffic should a neighboring development go in. Blaine County resident Karen Reinheimer said the city lacked transparency and prematurely halted the committee meetings. Huffman, a mainstay at comprehensive plan meetings for several years, reiterated to meeting goers that the Sun Valley Company owned the parcels in question and leaving them completely undeveloped is unrealistic. Hofman said the plans aren’t anything but a vision at this point, but that will change when Sun Valley Co. comes forward with a zoning map amendment application.